Plants cespitose, usually densely obpyramidal to oblanceolate above. Culms 70-210 cm; internodes occasionally somewhat glaucous just below the node; branches straight, mostly erect to ascending. Sheaths often scabrous, somteimes smooth; ligules 0.4-1.2 mm, ciliate, cilia 0.2-1.3 mm; blades 32-61 cm long, 2.9-5 mm wide, glabrous, rarely sparsely pubescent. Inflorescence units (9)50-210 per culm; subtending sheaths (3)4-5.9(7) cm long, (1.5)2-2.7(3.6) mm wide; peduncles (10)19-48(93) mm, with 2(4) rames; rames (2)2.5-3.7(4.5) cm, usually exserted at maturity, internodes evenly pubescent. 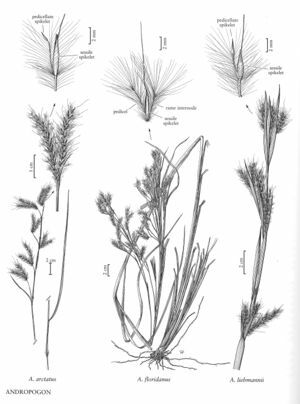 Sessile spikelets (3.8)4.4-4.8(5.5) mm; callus hairs 1-3 mm; keels of lower glumes glabrous below midlength; awns 5-15 mm; anthers 1(3), 1.3-2 mm, usually yellow (sometimes purple). Pedicellate spikelets vestigial or absent. 2n = 20. Andropogon floridanus grows on sandy soils in southeastern Georgia and Florida, being most abundant in Pinus clausa scrublands. It usually occurs in small stands, but stands of about a hundred individuals have been observed. This page was last edited on 20 April 2019, at 23:18.